Florida police are looking for a woman suspected of killing first her husband and then a woman who looked like her in order to steal her identity. Police say Ann Riess, 56 - who is now the target of a multi-state manhunt - was seen chatting with the victim days before she allegedly shot her dead. Lee County Undersheriff Carmine Marceno says the suspect aimed to steal the identity of Pamela Hutchinson, 59. She is now suspected to have fled to Corpus Christi, Texas, police say. Mr Marceno told NBC News on Monday that Mrs Riess should be considered armed and dangerous, and may soon kill again when she runs out of money. "She smiles and looks like anyone's mother or grandmother," he said of Mrs Riess, who authorities say has three adult children and one grandchild. "She's calculated, she's targeted and an absolute cold-blooded killer," he said, adding that she has a history of gambling problems. In a seven-second video clip released on Monday, filmed at the Smokin' Oyster Brewery on 5 April, Mrs Reiss is purported to be shown wearing a light blue shirt while chatting with the victim. The woman's "mode of operation is to befriend women who look like her and steal their identity", Mr Marceno said at a news conference on Friday. The murder occurred as Mrs Riess was hiding out in Florida after allegedly killing her husband in Blooming Prairie, Minnesota, last month, police say. 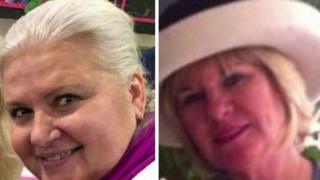 Mrs Hutchinson's body was found last Monday at Fort Myers Beach, but she may have died days earlier, police say. The suspect allegedly stole her victim's cash, credit cards, ID, and car before fleeing across state lines. Authorities are now searching for Mrs Hutchinson's 2005 vehicle with a Florida licence plate. Police in Minnesota have been searching for Mrs Riess since 23 March, after they found the body of her husband David Riess. Authorities say she may have stolen $11,000 (£7,600) from her husband's business before allegedly killing him inside their home. "Investigators believe Pamela Hutchinson may have been killed with the same firearm used to murder David Riess," the Minnesota Bureau of Apprehension wrote in charging documents. According to the FBI's annual crime statistics report, one out of 10 murders in the US are committed by women.